It was definitely a case of the luck of the Irish after builders recently discovered one of the country’s biggest ever hoards of gold coins buried beneath the floorboards of a County Tipperary pub. 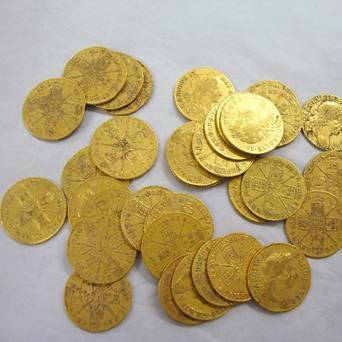 Eighty-one gold coins, mainly from the 17th century, were found concealed by soil by one of the workmen carrying out groundworks at Cooney’s pub in Carrick-on-Suir, one of the oldest pubs in the county until it was destroyed by fire. Most coins were, surprisingly, in excellent condition considering they date back to the reign of Charles II, James II and William and Mary. It’s thought the hoard is largely made up of guineas and half guineas, British gold coins struck by The Royal Mint between 1663 and 1814 using gold from West Africa – which is where the name ‘guinea’ came from. Research is currently underway to identify where the gold coins might have come from. Some experts believe they may have once belonged to a wealthy merchant as the town was a thriving trading centre in the 17th century. Others have different theories. One thing they do agree on is that the discovery is the most exciting archeological find in Ireland’s history since 1947 when a collection of over 100 gold coins plus a number of silver coins was discovered in CountyLaois. At the time of writing, it’s not known whether the workmen received any sort of reward but it’s got to be a worth a free pint at the very least! The gold coins are currently on display at the National Museum of Ireland. A selection of historic coins from The Westminster Collection can be found here. Coin Collecting – a fascinating and rewarding hobby PART II – What to Collect? There is a lot of satisfaction in collecting coins, be they ancient or modern, struck from gold, silver or base metal, from the Royal Mint or any other mint. Sign up to The Westminster Collection’s mailing list and you will receive regular information and offers on many different kinds of coins. You may however specialise in a particular type of coin or choose current UK coins. You’ll be offered the most current non-precious metal coins in uncirculated condition at an affordable cost. You can opt for commemorative coins or special issues from the various mints commemorating great events such as royal weddings, or the London 2012, special anniversaries such as a royal jubilee and even great people such as Winston Churchill. You could concentrate on historic coins. Although the rarest coins are probably best left to museums and millionaires, some very old coins can be surprisingly affordable. The Romans were great coiners during the four centuries they occupied Britain – and great hoarders of coins. Hoards of Roman coins are still uncovered by archaeologists and metal detectors. Collecting these old coins, handled by legionnaires, wine merchants and peasants almost 2,000 years ago provides a unique insight into and link with the past. There are many books on general and specialist aspects of coin collecting. The Internet is also an excellent source of information, though the quality and accuracy is sometimes unreliable. The sovereign was first issued in England in 1489, though the modern sovereign containing 7.988 grams of 22-carat gold dates from 1817. After stopping production in 1917, the Royal Mint started sovereign production in 1957, producing bullion sovereigns mainly for investors. “Bullion” sovereigns are essentially sold for their gold content value. 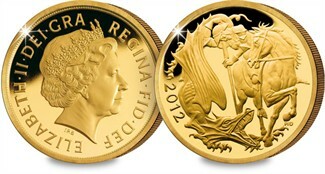 The Royal Mint strikes “Proof” sovereigns in limited numbers for collectors, often to commemorate a special event. The Royal Mint annually issues limited numbers of full sets of gold coins – half-sovereign, sovereign, £2, and £5 gold coins, which make a spectacular addition to your collection or a once-in-a-lifetime gift.